Listeners on Spotify Free accounts can stream a song only five times without being prompted to pay for it (this restriction kicks in after six months of using the service). To encourage people to buy tracks, Spotify introduced its very own music store in May 2011 that lets you buy digital music and download it to your computer as MP3 music files. So, after you discover an artist you like by using Spotify, you can then buy the track (or upgrade to a Premium or Unlimited subscription for limitless play; in which case you don’t really need to worry about the Downloads pane unless you want to buy tracks to copy to a CD, iPod, or other MP3 player). When you click the Downloads option in the left sidebar, all your downloaded tracks appear in the main pane. Because the Downloads feature is integrated with your Spotify account, you can easily access downloaded songs from this area, as long as you keep them in your specified Spotify folder and don’t move them around. To buy tracks, click the Get button next to a track or album listing to bring up a window that starts the purchasing process. From this window, you can buy bundles of credits, which last 30 days; the more credits, the cheaper the deal. Remember to use up your credits in the 30-day timeframe — otherwise, you lose them. 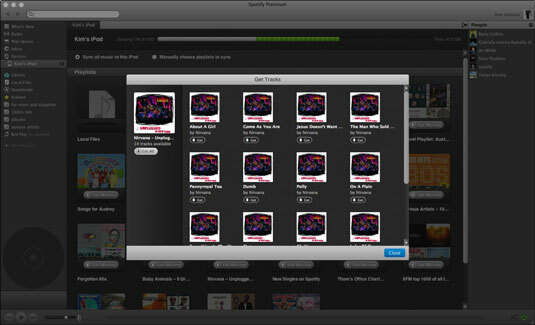 While you’re syncing your iPod, you can also buy any tracks from your Spotify playlists that you don’t own as MP3s. Just click the Get Missing button next to a playlist during the syncing process to bring up a window displaying the tracks you can purchase. The downloads listed in Spotify’s Downloads pane refer only to tracks you’ve purchased from Spotify’s own store, not ones that you bought from other digital music retailers, such as iTunes or 7Digital.